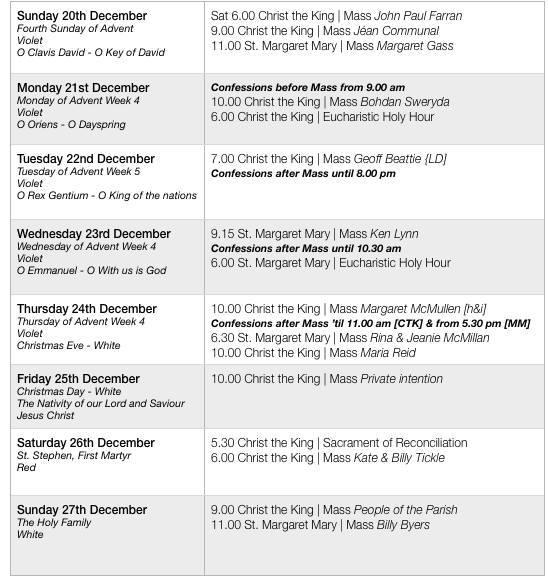 Please invite family members and friends to come along to Mass this Christmas. 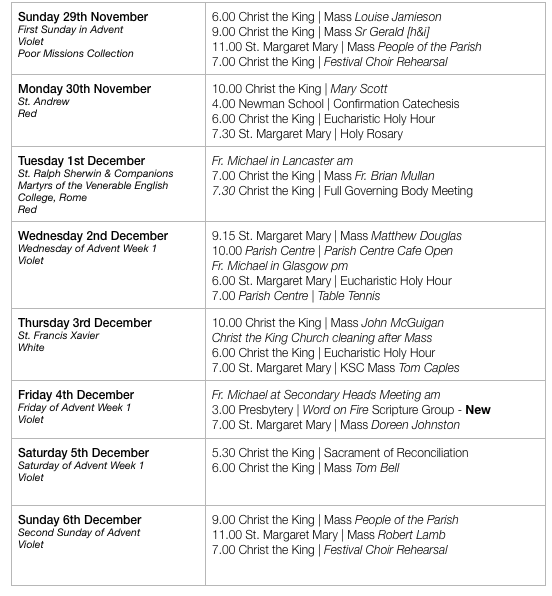 There are a number of opportunities to make use of the Sacrament of Reconciliation this week in the parish - please see times in the Parish Diary section. During the Holy Year of Mercy, we are encouraged to make frequent use of the Sacrament of Confession - please consider going to confession at least once a month during the Holy Year. Additional opportunities to frequent this sacrament will be made available during the Holy Year. A big thank you to those who supported the concert last Saturday in so many different ways: those who bought tickets and sold them; those who made cakes and savouries for the choir; those who ran around carrying goods and offering lifts and those who offered financial help and advice. Thanks too to the school for the loan of thirty chairs. The choir said the church looked beautiful and that it was a lovely place to sing in. They would be very happy to come to St. Margaret Mary again. Thanks to all involved in the Christmas Tree festival last weekend - a lot of hard work, commitment and dedication from a small team of dedicated workers: thanks to the charities and groups who provided the trees; to those who helped set up and clear away; the festival choir and musicians for their many months rehearsing; to those who provided a welcome and refreshments over the weekend and for all who came to the Carol Service on Sunday evening. All Catholics of the Diocese of Lancaster are encouraged to support an emergency appeal that has been launched by Cumbria Community Foundation. Cheques, made payable to: Cumbria Community Foundation, can be sent to CCF, Dovenby Hall, Cockermouth, Cumbria, CA13 0PN. Donations can also be made by text – 70070 with the message ‘FLUD15’ and a monetary amount. For example, ‘FLUD15 £10’. Please keep staff and pupils of Newman Catholic School in your prayers at this time. Plans are beginning to be put in place so that the school may resume teaching as soon as possible. Volunteers. There are opportunities to help relieve members of the volunteer corps. If you have a few hours to spare to help run the receipt and distribution centre at Fusehill Street University Campus, Tony Parrini will gladly receive your offer to help. Shifts are from 10.00am-1.00pm, 1.00-5.00pm (4.00pm Sundays). Contact Tony on 01228-674553 and leave your contact details. Accommodation. Carlisle is apparently full: there’s no room at the inn! If you know differently and could accommodate someone for a few weeks, please call into the Old Town Hall or phone 01228-817200. Likewise, if you have a room to spare or hospitality to share over the Christmas period. Sr Gerald & Sr Maureen invite you to join them each week to pray for a change of heart for the people of violence in Syria and for their victims. Mondays, 6.00-7.00pm. We have been asked by the Carlisle Food Bank if we can particularly supply items with a high protein content like UHT Milk, tinned meats and/or fish etc. There is a basket in the porch for items at Christ the King. The parish has received the travelling icon for this year of prayer for priestly vocations. There will be a Mass for Vocations during the Christmas octave, in which we will formally welcome this icon. The offering given during the Christmas Masses forms part of Fr. Michael’s annual taxable allowance from the parish. Gifts enclosed in cards etc are not included in this. Our Christmas Crib Collections will promote this year’s Mission Together (Missio) campaign [the same people as the Red Mission Boxes]. Please be generous in the crib offering. We wish all members of staff and pupils at St. Margaret Mary Catholic Primary School a well earned Christmas break. 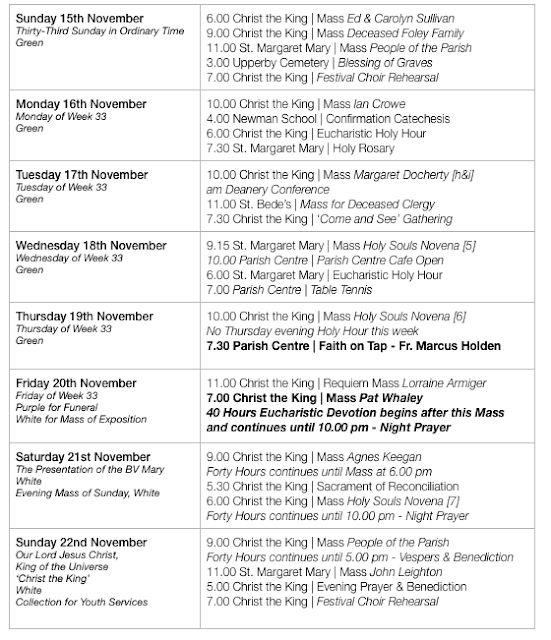 Thank you for requesting that Masses be offered for specific intentions. A high volume has been received in recent weeks - please be patient: Masses will be offered for those intentions as soon as possible. Please give plenty of notice (at least a month’s) for a specific date. The Papal Nuncio [the Pope’s representative in England and Wales] has written a letter to Bishop Campbell which expresses Pope Francis’ concern for the people of Cumbria during this time. A copy of the letter can be found in both churches. Bishop Campbell has written: ‘I extend my prayerful sympathies and thoughts to everyone affected by the devastating floods in Cumbria and North Lancashire of recent days. Our thoughts and prayers go out to parishioners who have been affected by the recent flooding in Carlisle and beyond. I’m grateful to the members at St Margaret Mary Parish Community Centre for their quick and generous response to the crisis and for parishioners, young and old, who have assisted those in need. All Catholics of the Diocese of Lancaster are encouraged to support an emergency appeal that has been launched by Cumbria Community Foundation. Cheques, made payable to: Cumbria Community Foundation, can be sent to CCF, Dovenby Hall, Cockermouth, Cumbria, CA13 0PN. Donations can also be made by text – 70070 with the message ‘FLUD15’ and a monetary amount. For example, ‘FLUD15 £10’. Volunteers. There are opportunities to help relieve members of the volunteer corps. If you have a few hours to spare to help run the receipt and distribution centre at Fusehill Street University Campus, Tony Parrini will gladly receive your offer to help. Shifts are from 10.00 am-1.00 pm, 1.00-5.00 pm (4.00 pm Sundays). Contact Tony on 01228-674553 and leave your contact details. Will meet on Thursday evening at 7.30 pm in the Committee Room of the Parish Centre. Fr. 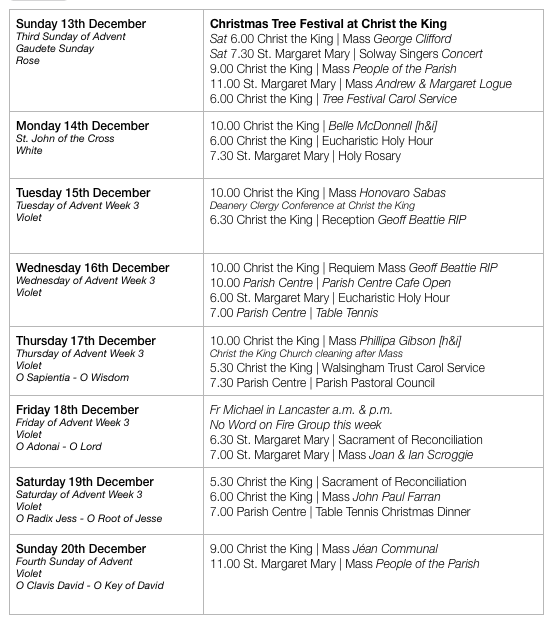 John Millar [of Our Lady of Eden parish] is organising an Advent Day of Recollection on Saturday 19th December. 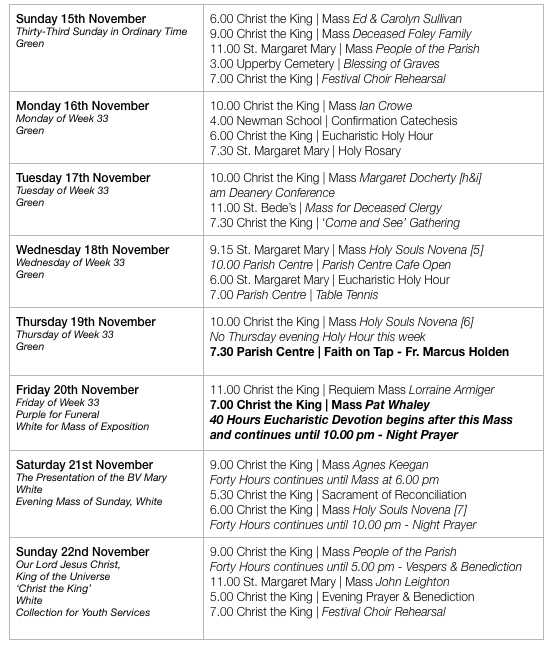 The recollection will begin at 9.00 am and conclude at Noon. If you would be interested in attending, please contact Fr Millar on 521509 or email: ourladyofeden@gmail.com. Figures for last week not available at the time of going to press. Saturday 19th December 7.00 pm in the Parish Centre. 3 course meal, choice of menu, £15 per person - open to all. If interested, please email: pauldlovell@aol.com for a menu and to pre-order your choice. Parish Confirmation Catechesis takes place on Monday evenings at Waterton Hall at 4.00 pm. Churches Together has organised carol singing in front of House of Fraser, Thursday 17th December at 6.30 pm. Funds will go to the charity TicToc which provides defibrillators. So please do come along to lend this good cause your strong voice! See the poster. Year 11+. A great week of faith, service, fun and friendship for the young people of our diocese, 21-30 July 2016. Deadline for applications: 28 February 2016. Book on-line now at www.castleriggmanor.co.uk/yatm-events. The parish will assist in funding this pilgrimage for any young person interested. Sr Gerald & Sr Maureen invite you to join them each week to pray for a change of heart for the people of violence in Syria and for their victims. Mondays - 6.00-7.00 pm. The Bishop has asked that both churches send two representatives to inaugural events in the diocese at Lancaster on Tuesday 8th December at 7.00 pm [Mass of Inauguration] and on Sunday 13th December at 6.30 pm [opening of the Holy Door]. If you would like to represent the parish, please let Fr. Michael know. This will take place at St. Margaret Mary on the afternoon of Wednesday 9th December at 2.00 pm. All are welcome - please come along. The Knights of St. Columba are organising a Family Quiz night on Friday 11th December from 7.30 pm - 10.00 pm in the Parish Centre. Please email: ksccouncil60@gmail.com or contact Paul Lovell for more information. Many thanks for your offering of £603 last weekend. There were 237 at church over the weekend. Saturday 19th December 7.00 pm in the Parish Centre, 3 course meal, choice of menu, £15 per person, open to all. Please email Paul Lovell: pauldlovell@aol.com for a menu and to pre-order. 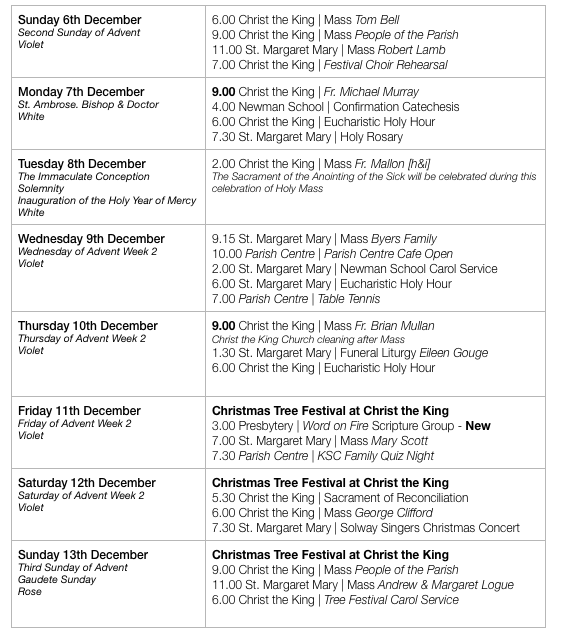 On Saturday 12th December at 7.30 pm at St. Margaret Mary’s a concert of Christmas Music [St. Nicholas Mass & Carols]. Tickets £7.50 - school-age children free. 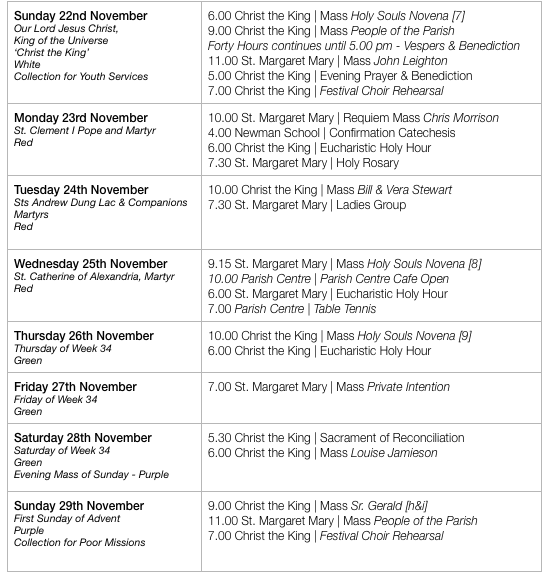 Tickets may be obtained by ringing 01228 402012 or 016977 746484 and from Judith after the 11.00 am Mass on Sundays. During the Holy Year of Mercy we are encouraged to make frequent use of the Sacrament of Confession - please consider going to confession at least once a month during the Holy Year. Additional opportunities to frequent this sacrament will be made available during the Holy Year. The Waterton Hall at OL&SJ is hosting a café where people living with dementia, their families and carers can meet to socialise and share experiences in a relaxed and informal atmosphere. Second Wednesday of each month 10.00 am – 12 noon. Churches Together has organised carol singing in front of House of Fraser, Thursday 17th December at 6.30 pm. Funds will go to the charity TicToc which provides defibrillators. Please do come along to lend this good cause your strong voice! See the poster.